Rebekah Hunter lay in the hospital bed, terrified. A nurse had taken Hunter’s underwear earlier in the emergency room and warned that an alarm would sound if they got out of bed. (Hunter, who presents as female, identifies as non-binary and uses the pronouns ‘they’ and ‘them.’) If Hunter had to use the bathroom or wanted to walk around the room, they needed to ask the nurse’s permission. Hunter, then 28, was already on edge. They had tried to overdose on ibuprofen and acetaminophen and were being held in the hospital under observation. Anyone would find the experience distressing, but Hunter’s distress was magnified by the fact that they are autistic. The experience was one of many that left Hunter feeling that no one in the medical community was willing to listen to them. And so it was with the nurses in the hospital, too. Scared of angering them, Hunter shut down completely and complied with everything they said. Hunter felt helpless; they couldn’t sleep because the lights were on all the time and the hospital gown was itchy. It took about four days of this “sensory torture” before they were released. Like Hunter, many autistic adults struggle to receive good care from doctors and hospitals. These individuals often find it difficult to communicate with healthcare professionals and are misunderstood or ignored. They’re less likely to have their routine health needs met, from dental check-ups to tetanus vaccinations. “I think that as an autistic person, I’ve had to habituate to other people’s rules and comfort levels,” Hunter says. Show and tell: At a clinic in Michigan, doctors use dolls to explain gynecological exams to women with autism. For their part, primary care doctors and mental health providers are often unprepared to treat this population. Many are unaware that adults on the spectrum are at risk for a range of other ailments in addition to their autism: Adults with autism are almost twice as likely as their typical counterparts to have diabetes, high blood pressure and heart disease, for instance. As a result, they die, on average, 16 years earlier than typical adults matched for gender, age and country of residence, according to one study. Making sure people on the spectrum receive routine and preventive care could help bridge that mortality gap. Croen and others are working on a number of potential solutions — including specialty clinics, online tool kits and training programs for community mental health workers. And some autistic adults, including Hunter, are eager to offer their input. More than half of all adults with autism have additional diagnoses. Apart from diabetes, high blood pressure and heart disease, they also tend to have obesity, autoimmune diseases, hearing impairment, sleep disorders and gastrointestinal problems — plus a laundry list of psychiatric disorders, including schizophrenia, depression and attention deficit hyperactivity disorder. Some of these conditions, such as constipation and sleep problems, are also common in autistic children, says Croen, which may be a consequence of the autism or reflect some common physiologic or genetic ground. But others, including heart disease, more often arise in adulthood. Still, autism is often erroneously described as a childhood condition, and children are where the vast bulk of research dollars and media attention are focused. The U.S. Centers for Disease Control and Prevention estimates that 1 in 59 children has autism, up from 1 in 150 in 2002. “These kids have been growing up and reaching their adulthood and now need medical care just like anybody,” Croen says. But all evidence suggests that’s not happening. One study last year, for example, analyzed the insurance records of more than 16,000 people with autism, aged 16 to 23, and found that outside of emergency-room visits, their use of healthcare services dropped significantly with age. Picture this: Props such as these drawings can help women understand all the steps of an exam. Once she has an appointment — to see her therapist about her depression, her endocrinologist about her polycystic ovary syndrome or her primary care physician about sinus issues — arriving on time can be a trial. She has learned to write down in advance everything she wants to discuss with her doctor because, she says, “my mind and my mouth aren’t always in sync.” And she wants details — all of them. In May, for instance, when her doctor prescribed a nasal spray for ongoing sinus issues, she wanted to know exactly why, when and how she should use it, along with any side effects. “I tell doctors, ‘Err on the side of over-explaining,’” she says. Her doctor didn’t mention the spray’s terrible aftertaste, which startled and distressed her. Joyce finds dental appointments to be the “absolute worst,” between her sensitive gag reflex and the discomfort of having her mouth “stretched open like the Grand Canyon.” Some women on the spectrum find gynecologic visits the most intimidating. Autistic women are significantly less likely to visit a gynecologist and get pap smears, which screen for cervical cancer, than other women of the same age. The gap may be due to a combination of factors: Primary care doctors may assume these women aren’t sexually active, for instance, or the women may avoid visits because they are hypersensitive to touch. Few clinics cater to these special needs. The Women with Disabilities Gynecology Clinic at the University of Michigan in Ann Arbor is one of the few that treat women on the spectrum. 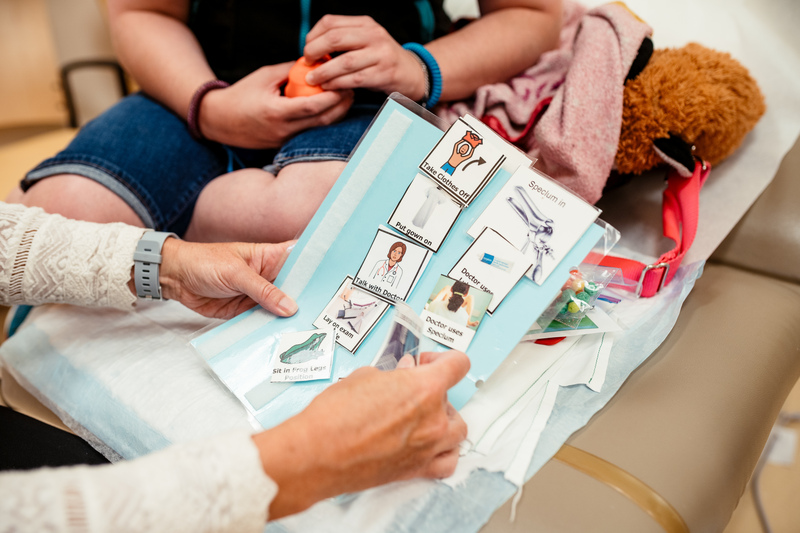 Unlike a typical women’s clinic, it has an array of charts, pictures and anatomically correct dolls, along with tiny speculums, so that the staff can tailor their explanations to their clients, including those with intellectual disability. Women who visit the office are also encouraged to bring advocates with them to help ensure they’re as comfortable as possible and receive all the information they require. Hunter’s doctor’s approach is the antithesis of what Ernst and others have found to be effective when treating people on the spectrum. At the Neurobehavior HOME program at the University of Utah, for example, the entire clinic is designed around people who have disabilities. The center is funded entirely by Medicaid and provides medical and mental health care to about 1,200 people with developmental disabilities, 60 percent of whom are autistic adults. Providers slot a full hour for each appointment, which allows for late arrivals and helps keep the waiting room quiet and uncrowded (crowded spaces are tough for people with sensory sensitivities). Exam rooms are large, allowing people to move around as needed and to bring caregivers along. There’s a phlebotomy lab on site, with staff trained to help ease anxiety during a blood draw. And a nutritionist works with clients to manage weight gain, a common side effect of seizure and antipsychotic medications that can contribute to other conditions, such as diabetes and heart disease. 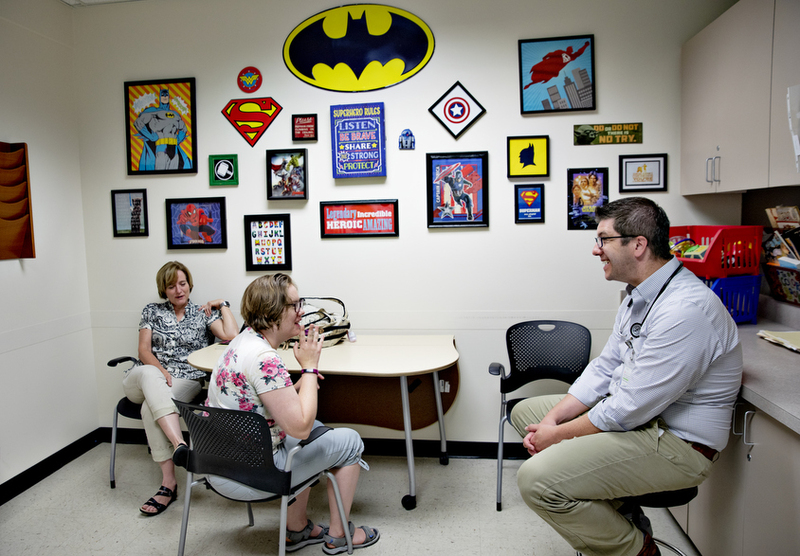 Added support: Autistic individuals and their family members meet with doctors in extra-large exam rooms at the Neurobehavior HOME program in Utah. “Being able to very closely integrate our care is huge, and we’re showing it’s leading to much better outcomes for adults with autism,” says Kyle Jones, who directs the primary care team. Although autistic adults have elevated rates of conditions such as diabetes, the clinic has better-than-average rates of controlling those comorbidities and fewer hospitalizations, Jones says. The vast majority of adults with autism don’t have access to anything like the HOME program, however. Other states either haven’t considered or have not been willing to fund similar clinics that provide ongoing care. 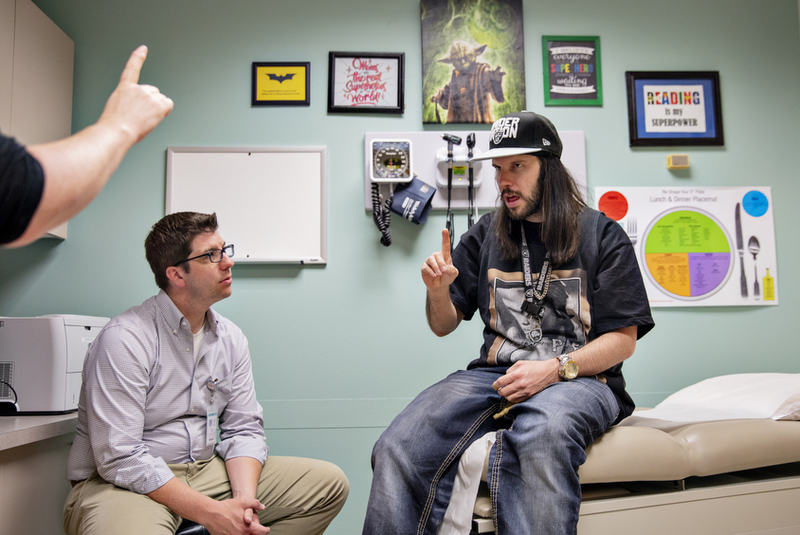 For now, most clinicians feel ill-equipped to treat autistic adults. That was the message Croen received when she surveyed hundreds of primary care and mental health providers in 2015. “They told us that they need more resources and training to work with adults with autism,” she says. Awareness is at least growing among the next generation of doctors. Ernst says dental and medical students at the University of Michigan in Ann Arbor are collaborating with a local advertising firm to create and distribute a list of providers who are good at working with people who have disabilities. (Ernst is on a national list compiled by the nonprofit organization Autistic Women & Nonbinary Network.) What’s more, she and her colleagues are developing a curriculum for the medical school on caring for people with disabilities, including autism. Educating providers early in their careers, these scientists say, will make treating autistic people less daunting and help them more fully address the needs of people on the spectrum. Until medical schools incorporate information about autism into their curricula, doctors and autistic adults have another resource to help them communicate and build better relationships. In 2016, scientists developed an online healthcare tool kit that offers a multitude of resources, from medical, legal and ethical information to worksheets that can help autistic people manage appointments. The tool kit is accessible through the Academic Autism Spectrum Partnership in Research and Education (AASPIRE), a research collaboration between several organizations. The centerpiece of the tool kit is an ‘accommodations report’ that an autistic adult or her caregiver can fill out and give to a doctor to inform treatments. “Because everybody on the spectrum is going to be different and have different needs, it’s really hard for me to tell a provider, ‘These are the things you have to do to take care of adults on the spectrum,’” says Christina Nicolaidis, an internist who leads the project. “[The accommodations report] provides really concrete, actionable items that providers would need to know,” she says — items such as an autistic person needing to have dimmed lights during an exam or to know how many test tubes of blood the clinician might draw. Nicolaidis and her colleagues tested the tool kit in 170 adults with autism and 41 primary care doctors in 2016. The participants reported that communication with their doctor improved one month after they received the tool kit. The next step, Nicolaidis says, is to see if the tools can be incorporated into primary care practices, as opposed to something individuals take to their physician. To find out, she’s collaborating with three large healthcare networks, two in Oregon and one in California. (Croen, at California’s Kaiser Permanente, is a collaborator.) In January, they launched the two-year study, which includes around 220 people at 12 clinics, about half of which will use the tool kit. Medical translation: At the HOME clinic, autistic adults can communicate with physicians via an interpreter. The tool kit incorporates data from interviews with dozens of autistic adults; another six actively helped to create it. Those pages include an extraordinary level of detail. “That comes from our autistic partners saying: ‘Wait, wait, wait. Don’t just tell me I should make an appointment; I need a script to follow,’” Nicolaidis says. Her team also worked with doctors to streamline the accommodations report so that they could actually use it. “When we first started doing cognitive interviewing with the doctors, it was a disaster: ‘This is too long’; ‘I can’t look at this’; ‘It’s too much information’; ‘You need to make it shorter.’” she recalls them telling her. Hunter has learned to self-advocate without the benefit of such a resource. Their new gastroenterologist finally diagnosed Hunter with irritable bowel syndrome and has been patient and communicative about finding a treatment. “He listens to me, takes his time with me, remembers my history,” Hunter says. “I get the sense that he cares about me.” Hunter has also started seeing a primary care physician who not only listens, but also actively encourages them to explain their needs — something many of the providers Hunter encountered did not support. “It’s so much better,” Hunter says. And Hunter is learning to advocate for others these days, too. While taking an abnormal psychology course last year, Hunter met a member of the AASPIRE team. Hunter jumped at the chance to pitch in and began reviewing and coding write-ups that struck close to home: descriptions of people’s negative healthcare experiences. In May, Hunter took on a bigger role with AASPIRE, becoming a community council member, offering feedback and creating resources to help others. In that capacity, Hunter will interact with adults on the spectrum and ensure that these individuals’ input is incorporated into programs and resources the group develops.